I've always been nervous before preaching-- it gives me energy. But when I first came to Grace six months ago (wow, it's been six months! ), I noticed the Sunday morning nervousness was amped up. My first Sunday Lynda or Marianna, maybe both, asked how I was doing, and I replied, "Terrified." That feeling persisted for several weeks and months; then I decided to seek out a spiritual director. The first thing he asked was, "How is your prayer life?" There are 33 circular beads around the circle, symbolizing Jesus' 33 years on earth. 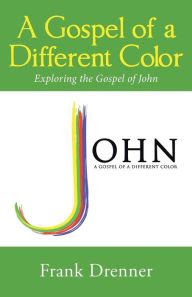 Beginning with the cross, you pray one prayer, then a different one at the invitatory bead. 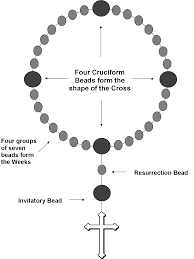 There are four large beads around the circle, which form the shape of a cross. They are called cruciform beads; they have their own prayer. Then in between the cruciform beads are seven smaller beads called weeks. They have their own prayer too. There are four total prayers prayed every day. The prayer book I use has the prayers tied to the lectionary, so the themes of the prayers are linked to the themes of the sermon. Two of the prayers I prayed this week, last week and this morning, directly spoke to me for this sermon. Last week: "When the Lord restored the fortunes of Zion, then were we like those who dream" (Psalm 126:1). This morning: "Purify our conscience, Almighty God, by your daily visitation, that your Son Jesus Christ, at his coming, may find in us a mansion prepared for himself." All during the week I am praying: When the Lord restored the fortunes of Zion, then were we like those who dream. When the Lord restored the fortunes of Zion, then were we like those who dream. And then I remember the Gospel text: Joseph heard an angel of the Lord while dreaming. I thought: What are we dreaming of this Advent? What are God's dreams for us? Matthew tells us that Joseph was a "righteous man," the same language used to describe Noah (Genesis 6:9). He was engaged to Mary, but discovered she was pregnant. He had several options: he could annul the engagement, divorce her, or if he had been a fundamentalist, could have her stoned on suspicion of adultery. But he decided to quietly breaks things off. But an angel of the Lord appeared to him in a dream... When the Lord restored the fortunes of Zion, then were we like those who dream... and told him not to divorce Mary. He did as he was told. He was obedient. The Romans text reminds us that we received grace to "bring about obedience" (verse 5). The Gospel of Luke tells us that Mary and Joseph could find no room at the inn, so Jesus was born in a barn. Purify our conscience, Almighty God, by your daily visitation, that your Son Jesus Christ, at his coming, may find in us a mansion prepared for himself. Purify our conscience, Almighty God, by your daily visitation, that your Son Jesus Christ, at his coming, may find in us a mansion prepared for himself. We hear Jesus speak about mansions prepared for us in the next life, but this prayer is focused on us in this life: are we preparing ourselves for his coming? Are we making our hearts a mansion to welcome him? Because she cannot walk, My beloved wife. I can’t open up for you, In case you’re a crook. That the gods of the heavens, Will give it to you. Because if I get upset, I’m going to beat you. I am a carpenter, Whose name is Joseph. Because I already told you, That we don’t have to open up. Because the mother is going to be, The queen of the heavens. How is it that at nighttime, She’s traveling so alone? And mother who’s going to make, The divine oath. Come in travelers!, I didn’t know it. And may the heavens overwhelm you, With Happiness! Happy (or blessed) is the house, That shelters today, The pure virgin, The beautiful Mary. I offer to you from the heart. Earlier in the service we sang O Little Town of Bethlehem, which ends with these words: "O come to us, abide in us, our Lord Emmanuel!" May Christ at his coming find you a righteous person. May Christ at his coming find your heart a mansion with lights on and doors flung open. May you welcome Christ this Christmas season and always! In the name of the Father, the Son, and the Holy Spirit, Amen.